The Mumbai player exuded his potential in the recent EurAsia tournament, where he scored two half-centuries for India A in three matches including 62 against Pakistan A.He displayed his class at No. 3 in the Under-19 2006 World Cup - barring the final, when the entire Indian line-up was blown away by rampant Pakistan fast bowlers - and displayed the key quality for that position: adaptability. Sharma has the temperament to adapt to the role of accumulator or aggressor, depending on the game situation. He is also a more than useful off-spinner - a skill he will no doubt be looking to hone so as to have a second string in his bow. He has been awarded by his inclusion in the One-day squad for the England and Ireland tour of 2007. After India's poor performance at the 2007 Cricket World Cup, selectors looked at new players to represent India at the national level. As a result, Sharma was selected for the limited-overs matches on India's tour to Ireland in 2007. He made his One-day International debut against Ireland at Belfast although he did not bat in the match. The unbeaten 142 in 123 balls for West Zone against North Zone in the Deodhar Trophy in Udaipur in March 2006 brought him further into reckoning. Performances for the Indian A sides in Abu Dhabi and Australia followed leading to him being selected for the 30 member probables list for the Champions Trophy (though he didn't make the final squad) and the Challenger Trophy. His first Ranji Trophy game for his first-class side Mumbai was in the 2006/2007 season. In his first few matches, not only did he make ordinary scores, but Mumbai, a traditional heavyweight in Indian domestic cricket, struggled mightily. It was in their match against Gujarat in December 2006 that Sharma hammered 205 in 267 balls and set the foundation for an innings victory for Mumbai. Mumbai then went on to win two more matches against Rajasthan and Maharashtra by an innings, thus making their way into the Ranji Trophy playoffs. Sharma hit a 50 in the final against Bengal and Mumbai won the tournament. After India's poor performance at the 2007 Cricket World Cup, selectors looked at new players to represent India at the national level. 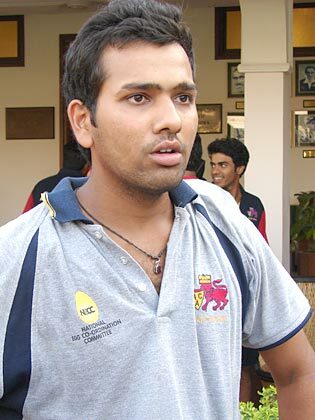 As a result, Sharma was selected for the limited-overs matches on India's tour to Ireland in 2007. He made his One-day International debut against Ireland at Belfast although he did not bat in the match. On the 20th of Spetember, against hosts South Africa, he made a sesational knock of 50(not out), and his valuable performance helped knock out hosts South Africa from the 20-20 World Cup. --------When did you start playing cricket? I think when I was eight or nine years of age. I used to play a lot of tennis ball cricket before I began playing with the hard leather ball. I was very famous in and outside my colony as a tennis ball cricketer. I was very much in demand, too! --------Does tennis ball cricket help in some way in improving one's game? It helps you play your shots on the backfoot. The tennis ball bounces a lot, particularly on the cement wicket. We used to play tennis ball cricket on cement wickets on which the ball would come very fast. In fact, tennis ball cricket itself is very fast and action-packed. It helps you improve your batting, bowling and fielding. Tennis ball cricket helps in the game played with leather ball, too. Of course, I soon started playing leather ball cricket as well. --------When did things actually begin happening in your career in terms of being noticed and nurtured properly? I was playing against Swami Vivekananda School in the final of a club tourney. My performance enabled my team to win that game by a good margin. Interestingly, the opposite side's coach, Raju Lad, was so impressed by my performance that he asked me to join Swami Vivekananda School. I was very happy by his gesture of appreciation. Unfortunately, I wasn't in a position to pay the astronomical fees charged by that institute. But he was keen to have me in Swami Vivekananda School by all means. He probably convinced the authorities of my ability as a cricketer, if not as a student, and I eventually ended up studying and playing for Swami Vivekananda School. Mr Yogesh Patel, the director of the school, arranged a scholarship for my studies. Gurunath P. Sharma (Rohit Sharma's father): "I'm very happy and humbly proud of my son Rohit, who has just begun to bring laurels, not only for his family but also for the country. I've never doubted his cricketing talents and always given him the much-needed encouragement and support. He is an extremely studious and level-headed boy. He has already played for Indian Under-17, Under-19 and India A teams. But I know he won't rest content till he makes it to Team India. Of course, he still has a lot to learn and also to improve his game a bit more. But I've no doubt that he'll do all that is required to be a better player than what he is today. The best thing about Rohit is his self-confidence which, if you observe carefully, always reflects in his approach to his batting. I'm sure success will never go to his head. It would be a very proud moment for all of us ? his family ? when he finally plays his maiden Test and One-Day International."